Contains fifty-five Story Cards and a CD that contains audio for each story. Cats need love and understanding – and that’s just the beginning! 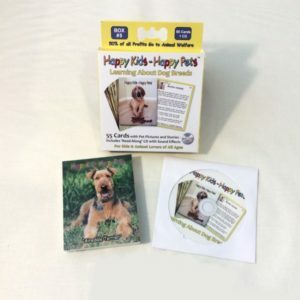 This cards helps kids (and adults) have a happy life with their forever friend. Our Trading Cards feature stories “written” and “read aloud” by cats – and since children relate well to animals, they can enjoy, while learning important lessons. 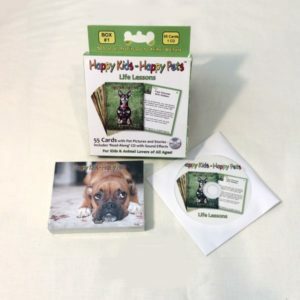 Kids love the cards, and they serve as a useful tool for parents, caretakers, and educators. There are 55 lesson cards in this “Learning About Cats” series that share important facts about cats and cat care. The front side of each card presents a precious, often funny, portrait of a cat and on the reverse side features a less than one minute “Read-A-Long Story Lesson” with an accompanying audio on CD. 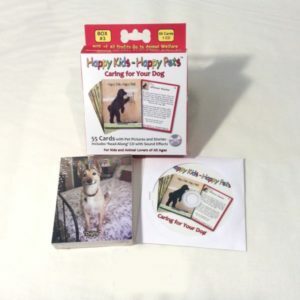 Kids can read the cards while following along with the audio or just listen while they look at the photos of the cats, either alone or with others. The messages truly come to life with wonderful sound effects. 15 “Traveling With a Cat” – How to travel with your furry friend. 16 “When a Cat’s Gotta Go…” – Litter boxes can be very useful. 17 “What’s for Dinner” – What kind of foods to feed your cat. 18 “Indoor Cats” – When cats live indoors. 19 “Older Kitties” – How older cats often behave, and how to help them. 20 “_______ Cats” – ________ are wonderful places to find a new friend. 21 “What Do Spay and Neuter Mean?” – What these mean and why they are important. 22 “What Are Feral Cats?” – What they are and how you can help them. 23 “Fewer Kittens Being Born” – How Trap-Neuter-Return helps feral cats. 24 “Black Cats” – These cats aren’t really bad luck. 25 “Tortoiseshell Cat” – These cats come in many colors. 26 “Calico Cat” – All about these cats’ color and personality. 27 “Tuxedo Cat” – These kitties are all dressed up. 28 “Tabby Cat” – A very popular color, but not a breed. 33 “________” – This breed of cat has a distinct personality. 43“Wise Cat Says… ‘We’re the Same” – Unique and the same all at once. 44 “Wise Cat Says… ‘Do You Get ________?’” – When children are ________ before a test. 45 “Wise Cat Says… ‘Want to Belong?’” – Don’t go along just to get along. 46 “Wise Cat Says… ‘Just Practice’” – Practice makes perfect. 47 “Wise Cat Says… ‘Different Is OK’” – Differences can be good. 48 “Wise Cat Says… ‘Be Your Own Person’” – Be yourself. 49 “Wise Cat Says… ‘Be Cautious Around Strangers’” – Watch out for stranger danger. 50 “Wise Cat Says… ‘Be Nice’” – Even if others are being mean, choose to be kind. 51 “Wise Cat Says… ‘Make Their Day!’” – Share some kindness. 52 “Wise Cat Says… ‘Time to Tell’” – When secrets can hurt you. 53 “Wise Cat Says… ‘Sticks and Stones’” – Words can hurt.